Advancing K-16 computing education in a state is a complex and collaborative endeavor. 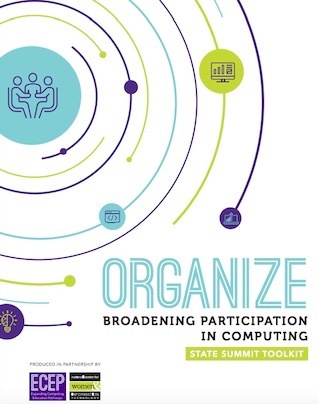 Computing education state summits are an important part of this process and can help to develop and advance a state’s strategy both for expanding computing education access and for broadening participation in computing (BPC). In particular, summits can promote equity and democratize change efforts by giving voice to all stakeholders in a collaborative and action oriented environment. In this toolkit, we draw from ECEP’s extensive experience convening summits within ECEP Alliance states and the territory of Puerto Rico over the past six years. States have shared valuable lessons learned through hosting these summits, and this document is the culmination of their efforts. It can help you define the purpose, create structure and plan the logistics for your summit, and help engage in follow-up efforts post-summit. We complement this material with practical resources from NCWIT that communicate the importance of BPC efforts and strategies that change leaders can apply to their efforts. Download the Summit Toolkit PDF HERE. Access the Summit Toolkit landing page on the NCWIT site HERE. This toolkit was created through a partnership between the Expanding Computing Education Pathways (ECEP) Alliance and the National Center for Women & Information Technology (NCWIT), with both organizations focused on BPC as NSF-funded organizations.